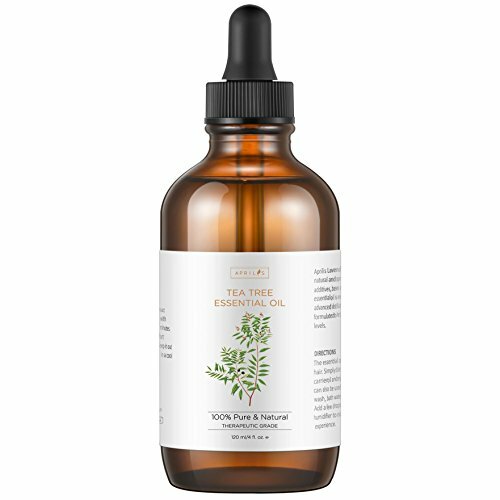 Tea tree oil comes from the leaves of melaleuca alternifolia, a small tree native to Australia. With potent healing properties, it has been used as a traditional medicine for cuts and wounds for centuries. Besides, the antibacterial properties make it a valued natural remedy for treating bacterial and fungal skin conditions, and preventing infections. Why Choose Aprilis Tea Tree Oil? Aprilis Tea Tree Essential Oil is independently certified as 100% pure and therapeutic-grade. It is great for use on multiple skin ailments. Its antibacterial properties soothe skin and clear blemishes without drying it. This oil can also remove warts, skin tags and ward off infections from piercings, scrapes, bruises, cuts, bug bites and burns. When applied to the scalp, it helps relieve itching and remove dandruff, leaving your head and shoulders flake-free. It even helps fight against serious scalp problems such as lice infestations. Diffusion: Use three to four drops in a diffuser. Topical use: Apply one to two drops to the desired area. Dilute with a carrier oil of your choice to minimize any skin sensitivity. 1.Tea tree oil is not to be used on deep wounds or near the eyes, ears, and nose. 2.Discontinue use if any discomfort occurs. If you have any questions about this product by Aprilis, contact us by completing and submitting the form below. If you are looking for a specif part number, please include it with your message. Nasomatto Pardon Extrait De Parfum, 1.0 Fl. oz.